Electric vehicles are fast becoming an alternative to fuel powered vehicles as they are non-polluting and cost efficient. However, they require a wired charger which needs to be connected to the vehicle while charging. Often this is not quite feasible as your packing space might not have a socket nearby. To overcome such choke points in using electric powered vehicles, Evatran Inc which is a Virginia based technology company has introduced a revolutionary device that can charge your vehicle wireless using the principal of electromagnetic induction. It safe, convenient and hands-free and allows you to charge your vehicle anywhere. Here’s how it works: The device needs a floor mounted parking pod along with a separate adapter unit in the vehicle. 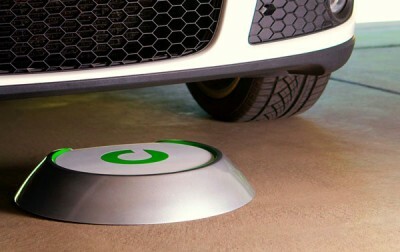 The parking pad uses the electric current to create a magnetic field which is received by the adapter in the vehicle. This is again converted into a current which charges the vehicle. The parking ad is floor mounted and is controlled by a separate power control module. Also included is an indicator which guides the user in aligning the vehicle correctly and displays the charging status. The system automatically gets activated once the vehicle is in the correct slot and shuts off whenit’s fully charged. You also have an option to turn off the charging and move your vehicle after sometime and can also use a normal cord based charger. It currently supports the Chevrolet Volt ad the Nissan Leaf models. The model is yet to be released and is estimated to cost around $3000 along with installation by their team of professionals. A pre-launch unit was also installed in Google headquarters in March 2011.The device can be installed in your home, office as well as in commercial establishments. It can also be used by fleet owners who would need to regularly charge their vehicles.